It seems like Rievent announces valuable developments all the time! Just thirteen months ago, we introduced support for regularly scheduled series (RSS) CME. That enhancement was a significant breakthrough as RSS is an important CME format at hospitals around the country. Now we’re excited to introduce a new product that can benefit nearly every provider of online continuing education (CE) for professionals: Embed Technology. With this new product, learners won’t have to leave your website to participate in CE anymore. They can do everything from your existing interface. It’s most seamless online continuing education experience we’ve ever developed. It’s still your website. It’s still your learner experience. That’s the essence of Embed Technology – learners won’t have to change how they already access content from your website. Instead of logging in to separate CE software to select activities, view content, take tests, and request credit, Embed Technology lets learners do all of those things within your current interface. 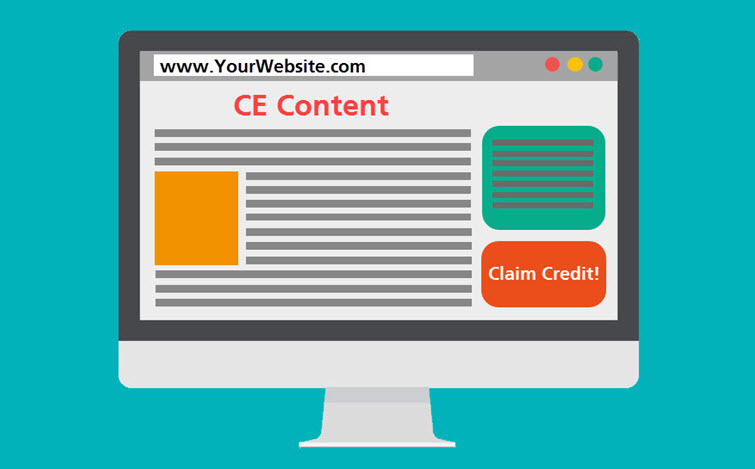 We literally “embed” the CE activity inside your website. Simple as that. On a desktop device, the continuing education activity appears alongside your content. We purposely designed the embedded learning experience with “branding-neutrality” so that your learners always perceive a seamless, integrated layout. Learners can also complete activities while viewing your content on a mobile device. If you already publish CE content or your learners perform CE-related tasks online, Embed Technology is for you. Embed Technology will be available in the coming months. After 16 years of working with CE providers who publish content online, we know this development has the potential to change how providers deliver and award credit to professional learners. When we deploy Embed Technology within your existing website, you retain all of your branding and your current design – the embedded CE activities “live” alongside those elements. For providers taking advantage of single sign-on (SSO), learners won’t even have to log in again. They’ll be able to begin an activity in just a click or two. All learner CE records will be available within the Rievent Platform’s Learning Portal, just as they are now. You can even use Embed Technology in addition to the standard Rievent Platform experience. That way, learners can participate in CE however they prefer. Get in touch with us to find out more about Embed Technology! Getting started with Rievent is easy, just like it’s always been.